A report United States Environmental Security Technology Certification Program (U.S. ESTCP) recently released a report that describes the testing of a new direct-push optical screening tool for high-resolution three-dimensional (3D) subsurface mapping of chlorinated solvent dense non-aqueous phase liquids (DNAPLs) in unlithified sediments. Unlithified sediments are sediments that have not undergone lithification, a process whereby sediments are transformed into solid rocks. The sediments are still in loose form and have not become compacted by pressure. The tool was field-tested at a formerly used defense facility in Massachusetts in fall 2013 (Geoprobe® delivery) and again in March 2014 (CPT delivery). The new tool, a laser-induced fluorescence (LIF) technology referred to as “DyeLIF™,” was developed and validated during this project and is now commercially available. 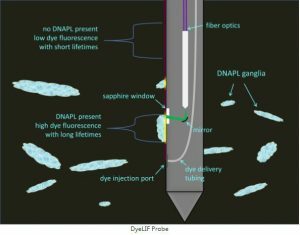 The DyeLIF probe functions by injecting an aqueous delivery fluid containing a proprietary hydrophobic dye through a small injection port that is situated below the LIF window. As the probe is advanced through the subsurface, the injected dye contacts the soil and quickly partitions into any present DNAPL. Standard LIF tooling is used to detect the dye-labeled chlorinated solvent DNAPLs. The fluorescent signature of un-solvated and solvated dye is sufficiently different. Chlorinated solvents are among the most common organic contaminants detected in groundwater at US. DoD sites. The sources of these contaminants are often historical releases of DNAPLs. Unfortunately, chlorinated solvent DNAPL source zones are difficult to locate using conventional subsurface characterization technologies. Laser-induced fluorescence (LIF) tools are currently available for real-time, high-resolution mapping of petroleum hydrocarbon and coal tar-based NAPL source zones. These LIF tools do not work with chlorinated solvent DNAPLs because chlorinated solvents lack the aromatic structure responsible for the laser-induced fluorescence in coal tars and petroleum hydrocarbons. The objective of the field demonstration was to provide a field-scale demonstration of the new DyeLIF tool for high-resolution subsurface mapping of chlorinated DNAPLs. The real-time, high-resolution profiles generated from the DyeLIF were then compared to profiles from high resolution vertical soil sampling with subsequent dye shake tests and quantitative laboratory VOC analysis. No major implementation issues were identified during the field demonstrations. However, a key limitation for any direct-push technology is suitability of the geological conditions for direct-push probing, i.e. absence of cobbles or other conditions that would cause tool damage and preclude advancing the probes.